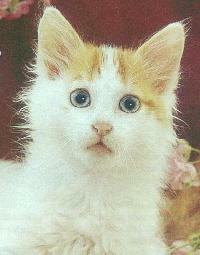 The Turkish Van is a big, beautiful cat with distinctive markings on its head and tail and an unusual love of water. Also known as the swimming cat, the Van loves to paddle its paws in streams, fish for its supper and even take a cooling dip in your bath. The Van has survived virtually unchanged since Biblical times and shares the area known as "the cradle of civilisation" with mankind. The breed originated in the very remote and rugged Lake Van in the south eastern province of Turkey. The cats have medium length coats which require very little grooming and once mature they develop manes in the winter months. The coat is also waterproof. Essentially the characteristic auburn markings on the chalk white body should be limited to the tail and the top of the head. A random spot on the body is known as the mark of Allah. Other breeds, with limited colour in the coat, borrowed the word, "Van" from this breed to help indicate the colour pattern. It is accepted that the Turkish Van is the original piebal cat and one of the first long hair mutations which is not man made but a result of natural selection through inbreeding in an isolated area. The cats ears sit quite high on their heads, and their bodies are long and broad - often reaching three feet in length. Turkish Van cats are considered on of the largest of the domestic breeds and are quite massive at maturity - the only cat that cannot follow its head through a fence due to the breadth of the chest. Aside from the large chest and shoulders they have broad muscular hips. The width of the pectoral and pelvic girdles give the Turks quite a distinctive swaggering gate. Fully mature males weigh anything from 9 - 12 kg's. Females are substantially smaller. Vans usually have their tails in motion - in every direction imaginable a habit that is known as "flouncing". The tails seem to function totally on their own. Even when the cat is asleep, its tail remains active and the cat will eventually grab its own tail and pin it under its legs for a more peaceful nap. This is a very intelligent breed that can be taught to perform tasks. They are happy to walk on leads and join the family dogs for a walk. When it comes to courage, it is a known fact that the van has the heart of a lion. When cornered by dogs it will bite viciously to defend itself. Summer heat is probably what drove the early Vans into the water. Many cats of different breeds will play with water dripping from a tap or in a puddle outdoors, but the Vans are truly the only domestic breed known for its love of water and the joy it gets from swimming. Lakes, streams and ponds are the most prized, but sinks, tubs and even water dishes will do if the cat desires a dip. Turkish Vans are highly independent, yet still affectionate to their human charges. They are very smart and always in control while playing. 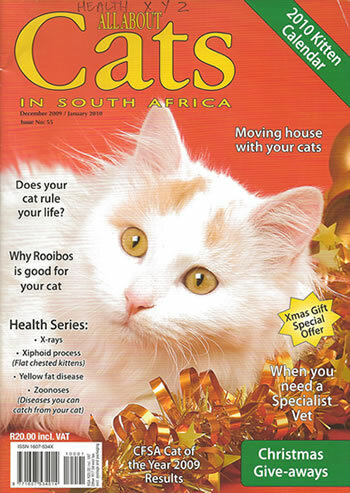 The cats enjoy retrieving games, hide and seek and even play with toys. The first Vans were imported into South Africa in the seventies but were involved in a motor car accident and were never recovered. 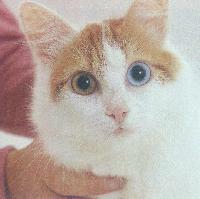 Bardine Levin, found a stray in the eighties with a character similar to that of Vans and through this cat developed an affilliation with the breed. Consequently she imported and reintroduced the first pair into South Africa in 1990. Bard retired from breeding Vans in 2007.
in the UK (that includes England) - The Turkish Van Cat Club - +44 1454 320401 or contact Jan Dowling, +44 (81) 984-1550.